I’ve been sick again this week. I don’t know what’s been wrong with me the past five months but I can’t seem to shake this illness. Three times I’ve been sick for a week or more with sinus pressure, cough, sore throat, runny nose, stuffy nose, body aches, headaches and the most recent addition to my incredibly healthy existence, pink eye. I haven’t come into contact with any symptomatic individuals (that I know of) but in my weakened state even the slightest opportunity for bacteria to find me will end in success. I have the evidence to prove it; it showed up Sunday afternoon. My lovely wife took me to Urgent Care that night and I was given some drops to use for the next week. While I’m on the mend (and still waiting patiently for the closing on our new house) I have turned to trip planning. The dog sensed my weakness and took complete control. I’ve jumped head first into planning our San Francisco road trip. Sure, our Winnipeg weekend in June is sooner but the San Fran trip is longer and requires more complex planning. Besides, we’ve already got the hotel booked for Winnipeg using one of Travelocity’s secret deals. These deals keep the name of the hotel secret until you pay. It was a scary thought for a stereotypical over-planner like myself, not knowing which hotel we were booking, but Travelocity assured me it would be a great establishment for a great price. Once paid for, we discovered we will be staying at a top five hotel in all of Winnipeg and for much cheaper than the average rate that busy sports weekend! Very cool. Anyway, our San Francisco road trip is set for September when the Vikings play the 49ers. Based on that date of 9/14 I’ve sketched together a basic outline of a trip. By leaving the Saturday before Labor Day we can take advantage of an extra paid day and make the trip into a whopping 15 days! We’ll even have a recovery Sunday before we have to return to work. Bluck! The trip is months away and I am already dreading returning to work. I don’t want to give away too much about the trip before we go (and spoil the eventual blog post) but I will give you a couple of highlights. Assuming we take the trip as I have it planned so far, we will see Mount Rushmore, Yellowstone National Park, San Francisco (duh), Las Vegas, the Grand Canyon, Arches National Park, Denver, and scenic Omaha, Nebraska! I still need to narrow down the exact route. I have to figure out accommodations to and from the Bay Area where Beth has family. I still get to find cool places to stop along the way. 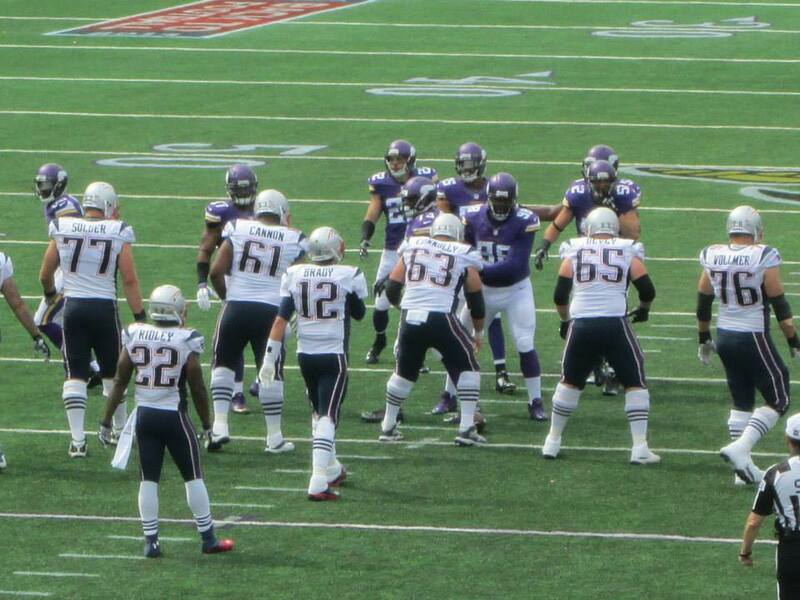 This is a picture from the Vikings-Patriots game coincidentally on 9/14 last season. Clearly Tom Brady cheated by deflating the footballs which led to the Patriots winning 30-7. At least we had great seats. We’re coming Frisco, SKOL VIKINGS! There’s much to do and like all the other massive road trips I’ve planned, everything is subject to change. On our East Coast trip in 2012 I wanted to see the Rock and Roll Hall of Fame when we passed through Cleveland but I eventually realized there wouldn’t be enough time. I picked a couple quicker attractions to see in Cleveland instead and continued planning the trip. When the day came and we were driving through Cleveland, it was raining, Beth was asleep, traffic sucked and we were behind schedule because I was now begrudgingly driving the speed limit (screw you Indiana). I drove right through Cleveland.Sometimes plans change on trips. I’m just going to have to get over it. I didn’t say it would be easy. Next time Cleveland, next time.So, barring potential changes, we’re going on one hell of a trip! On paper, it’s a minimum of a 4500 mile drive. With side trips and driving around the Bay Area, hopefully that total will breach the 5000 mark. We’ll see a lot of awesome places and things and I will even get to cross Idaho off of my states list! Planning this trip is going to be a lot of fun and I’d be lying if I didn’t say that was at least one-third of the fun. I’ll keep you updated and don’t forget to check out my latest Fun with Maps posts.